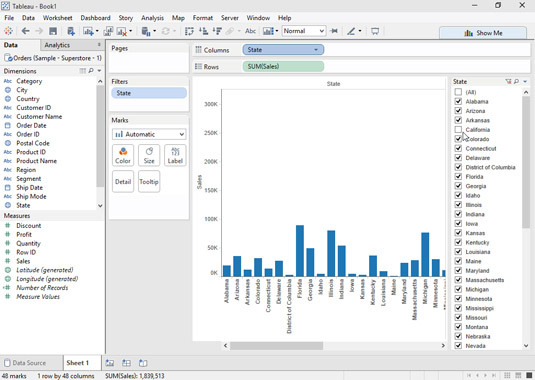 Often you may want to filter the data that’s displayed in your view in Tableau. Furthermore, you might want your audience to have the same option of filtering to what they would like to see. Quick filters offer the advantage of making it easy for you to change the view for yourself while also allowing you to provide a control for other users to select from. Click the down arrow at the right side of the field on the shelf (or the Data pane) to display the field’s pop-up menu. Display the menu for the field. Choose the Show Quick Filter option to display the quick filter. In the pane that appears on the right side of the screen, deselect the check boxes for any data that you want to exclude from the visualization. 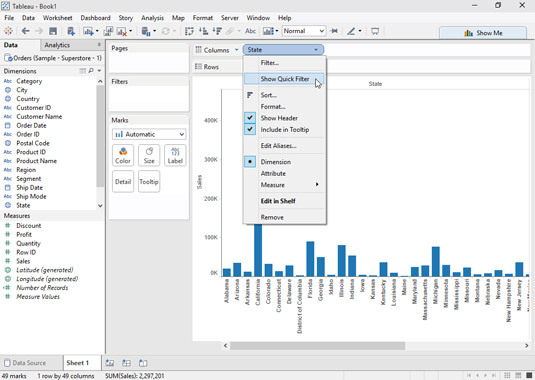 Deselect the check boxes for the data that you want to exclude from your chart. When you add a worksheet to a dashboard, your quick filters will show up on that dashboard by default. That way, it’s easy for people viewing the dashboard to filter the data themselves. In that case, you may find the long list of selections to be unsightly or that it takes up too much space. Change the display by clicking the drop-down arrow at the top of the Quick Filter pane and choosing something like Multiple Values (Dropdown).